Chevrolet MyLink will respond to spoken commands. Editor's note: An earlier version of this story listed the wrong location for Nuance, a provider of voice recognition software. DETROIT -- General Motors Co. will introduce a competitor to Ford's Sync infotainment system that will provide text messaging, e-mails, traffic advisories and other connected-car functions. The system, called Chevrolet MyLink, will let motorists link their smart phone and its functions -- such as texting, calls, music or navigation -- to the vehicle's voice recognition software, sound system and navigation screen. MyLink will be launched in the Chevrolet Volt and Equinox this fall. Later, GM will offer it in the rest of Chevy's models, as well as Buick, Cadillac and GMC. The automaker did not provide a timetable for the rollout. Chevrolet MyLink lets motorists choose new applications online and continuously update software. More important, it provides the applications safely, said Micky Bly, GM's executive director of global electrical systems, hybrids, EVs and batteries. By using spoken commands, motorists can use MyLink without taking their hands off the wheel or their eyes off the road, Bly said in an interview. Most automakers "are trying to make sure that they display things in a safe, secure manner," he said. "We don't want to step across the line" and distract motorists. MyLink could represent GM's first real competitor to Sync, a system that's available on all Ford and Lincoln vehicles sold at retail and has lifted Ford's reputation as a technology leader. The basic Sync technology allows people to control cell phones and portable music players by voice. Since Sync's debut on the Focus in 2007, Ford has enhanced the system several times, adding services such as emergency 911 assistance and vehicle health reports. 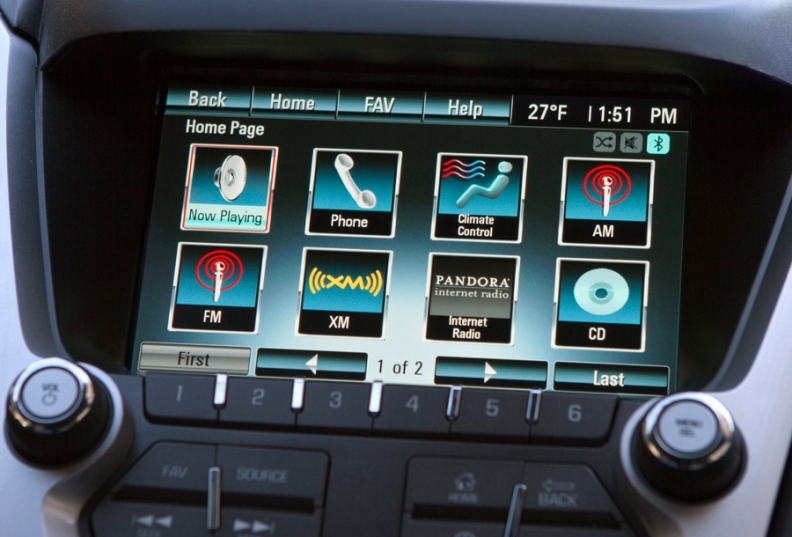 Ford has installed more than 3 million Sync units. Sync comes standard on Lincoln vehicles, and the automaker says about 80 percent of people buying 2011 Ford models opt for the $395 system. Sync and other similar devices are drawing more scrutiny from U.S. regulators who are studying the impact of driver distraction on highway fatalities and injuries. U.S. Transportation Secretary Ray LaHood recently held meetings with GM, Ford and Chrysler officials on the matter. GM will continue to offer its OnStar service with Chevrolet MyLink. OnStar, which offers 24-hour roadside service, route guidance, emergency assistance and other features, will be positioned as a package of safety services. Chevrolet owners will get a basic mix of telematics services when they buy their vehicles. Then they will go online to add apps and update their systems. The first wave of apps will include Pandora, an online music source, plus Stitcher, an app that lets users create customized radio stations to play their favorite podcasts. Motorists without smart phones would be able to place calls, respond to text messages and use turn-by-turn navigation using OnStar. But a smart phone is needed for access to Pandora, Stitcher and other apps. QNX, a division of BlackBerry producer Research in Motion Ltd., provides the software operating system for MyLink. Nuance, of Burlington, Mass., provides the voice recognition software. QNX is a longtime GM partner in telematics. Its software customers include Audi, Acura, Ford, GM, Hyundai and Saab. Nuance has developed a leading voice recognition technology dubbed Dragon Dictation. GM will use OnStar's hardware to integrate Dragon Dictation into the cockpit. Bly said GM would review all software applications to make sure they meet the automaker's safety standards, and to ensure that the software is bug-free. "We're going to keep [all applications] in a 'walled garden,'" Bly said. "We know our software will be virus-free." Leslie J. Allen contributed to this report.